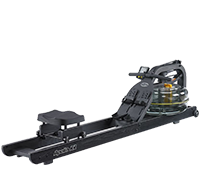 The versatile indoor rower Life Fitness Row GX Trainer is perfect for institutions, who want to upgrade their equipment by a rower of very high stability. At home, the Life Fitness rowing machine is also a perfect option, because it is very smooth and silent and can be perfectly adapted to the user. The Life Fitness rowing machines Row GX and Row HX present a successful combination of outstanding workmanship quality and attractive design. Both Life Fitness models convince by a water resistance system, which gives the machine a comfortable rowing experience close to reality. Life Fitness rowing machines offer a training for every fitness level thanks to their resistance system. While rowing with water resistance, the difficulty of the training increases with the intensity of your stroke. That means: When you pull quickly and strongly, the training is heavy. Life Fitness rowing machines offer another possibility to set the basic resistance. You can individually adjust your training intensity with the Row GX in 16 and with the Row HX in 4 resistance levels. A heart rate chest strap is optionally available for users who want to train pulse-oriented with the rowing machines. The Life Fitness rowing machines convince by their optimal ergonomics. It is ensured by adjustable treads, the comfortable seat upholstery, and the hand-friendly rowing handle. Due to the practical folding mechanism, the rowing machines can be folded up and stored space-efficiently. 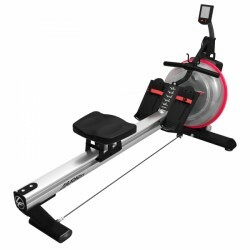 The rowing machines Row GX and HX are equipped with an intuitively usable training computers. The computer provides you all important training data as i. e. calories per hour, distance and time, and is also four times adjustable in incline. You always see all training values on a clear LCD display with an optimal viewing angle. Compared to the Row HX, the Life Fitness Row GX Trainer offers nine training programmes (of it six training profiles), i. e., quickstart, manual training, and an interval training programme. You can create your training individually and always keep motivated. 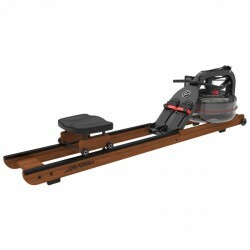 The highlight of the Life Fitness rowing machine Row HX is its precious wood design. The extraordinary design makes the Row HX Trainer a real eyecatcher. Purchasing this machine, you get a training partner of high value, which looks really good.